I am slowly putting my kit for Cesarean/Gallic wars era. I have a coolus without cheek plates, plan on getting a cesarean era gladius and sleeveless hamata and making a leather doubler. I think that the next project on my plate will be a scutum, and my question is about the spina/boss. I see that most Republican era reenactors use a spina on their scutums, but I have seen a few that use a plain round boss. I haven't found much info on this era and was wondering if using a round boss, or something like I have pictured was possible. (12-04-2015, 12:46 AM)mboyce Wrote: I am slowly putting my kit for Cesarean/Gallic wars era. I have a coolus without cheek plates, plan on getting a cesarean era gladius and sleeveless hamata and making a leather doubler. I think that the next project on my plate will be a scutum, and my question is about the spina/boss. I see that most Republican era reenactors use a spina on their scutums, but I have seen a few that use a plain round boss. I haven't found much info on this era and was wondering if using a round boss, or something like I have pictured was possible. 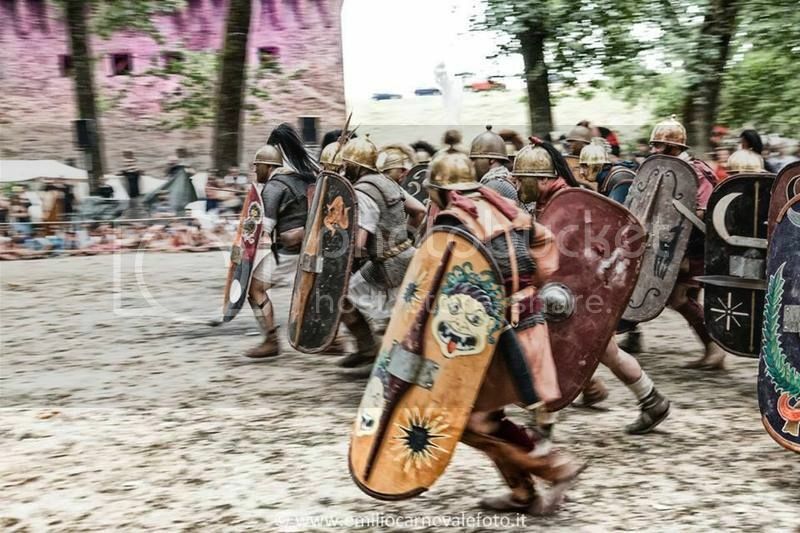 I know that it is not always wise to base an impression off of another re-enactors impression, but the guy with the red shield has a round boss. My basis for using a round boss is,,,that's what I have, plus with the thousands of shields produced at the time there had to be some variation besides the spina and metal boss.